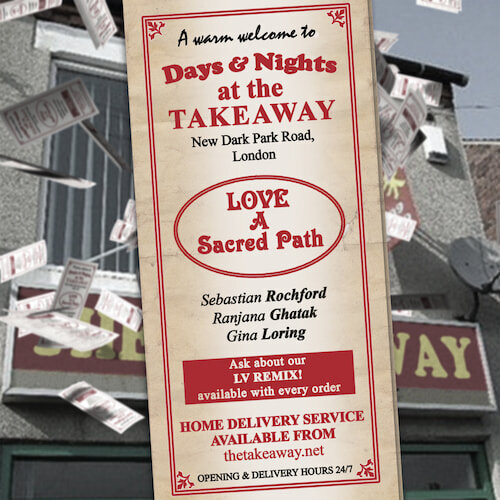 Days And Nights At The Takeaway is a monthly digital singles club curated by Polar Bear’s Sebastian Rochford, which runs throughout 2012. Each single will take the form of a two track digital single, released on the last Friday of the month. Seb is working with a different collaborator (or collaborators) every month, backed with an exclusive remix of the track. This, the first release in the series, is a collaboration with LA poet & singer Gina Loring and British Indian vocalist Ranjana Ghatak, entitled ‘Love A Sacred Path’. The track comes complete with a superb remix by Keysound/Hyperdub mainstays LV. The artwork for each release takes the form of an imitation takeaway menu, and the visual reference is carried through to the project’s dedicated blog.